Fresh ripe tomatoes make great salads, sides for designer meals and are delicious when baked with cheese. All these cosy homely feelings can be captured and given to your clients creating a great vibe around your company image. 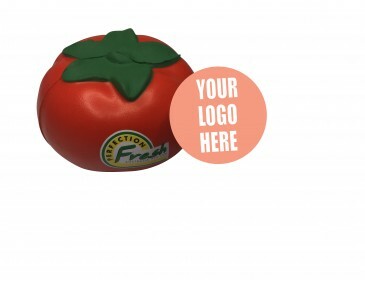 We offer a fabulous fun stress tomato toy for branding, that you can give to your clients as premium give-aways. Use them at meetings, trade shows, expos, corporate conferences, seminars and product launches. They are fun and useful too. Stress toys are great for health and well-being, allowing built up tension to be released in the work place, at home, at college or in the car. Our stress tomato comes in a bright bold colour with a smooth body that feels just like the real fruit. A leafy stem on the top completes the authentic look. Our tomatoes are made from a pliable material that can be squeezed, bashed and smashed and will keep its shape. Use this fun toy to add some colour to your advertising campaign. Our listed price includes branding of your logo or graphic in a single colour print onto the tomato. We offer a product turnaround time of two weeks, but we can offer even faster turnaround times for urgent orders. This product is supplied in bulk quantities. Please note that our prices exclude GST and a print set up of $75 applies. This item is available for delivery within Australia only. Fruit and vegetable stores, fresh produce markets, fruit juice outlets and businesses in the food sector will enchant your clients when you give them stress toy tomatoes as freebies. These are also fabulous at promoting a healthy lifestyle. Also consider health themed printed stress items. They make fun desk ornaments and your name and brand will be on display for all to see.